So I’ve been kind of obsessed with fermenting these past couple of months. I started with the most basic kind that’s super easy to do — fermented cabbage (sauerkraut). So well in fact that I’ve been on roll ever since. Bananas! They can be fermented! I was actually really reluctant to try fermenting bananas at first. I was sure that trying to ferment starchy bananas would lead to them rotting instead. This might have to do with my fertile imagination or the fact that not much has been written about them (compared to other fruit ferments). But even though I was sure it’d turn out to be a total failure, I still tried it out of curiosity. Boy, am I glad I did! Because fermented bananas has been my most delicious ferment yet. They’re tart, fizzy and slightly sweet. The smell is wonderfully banana-y. And you know the “dry tongue/mouth” feeling you get when you eat fresh bananas? Well, with fermented bananas, that doesn’t happen. I’ve gotten very moist and soft slices, almost like they’ve been cooked slowly. That’s the magic of good bacteria — those little guys have pre-digested my bananas to culinary perfection. And I didn’t even have to pay them 🙂 All they craved was the sugar in my bananas. The first time, I only used one banana. Yup, just one. I was so sure it won’t turn out well that I didn’t want to waste more. I cut the banana into medium slices. I add a tablespoon of good brown sugar (demerara), a generous pinch of real sea salt, and the powder contents from 1 probiotic capsule (this acted as my starter). Then I plop the sliced bananas into the glass, leaving about 1-1.5 inches of room at the top. The extra room is needed because the ferment will expand and rise. Finally, I covered the top with a bit of clingfilm and held it in place with a rubber band around the mouth of the glass. Left this to sit in a dark cupboard for 5 days. On the fifth day, I took the cling film off and took a whiff. This is “the smell test “. That deciding moment when you know whether a ferment has turned out well (i.e. the good bacteria won) or has gone off (i.e. the bad bacteria/yeast/mold won). It smelt good. Really good. I ran with the glass to the kitchen, got a clean spoon, scooped up the top slices and popped them into my mouth. Oh yeah… they were good alright. The top slices had turned a little brown and were mushy, but they still held together as a banana slice. It hadn’t turned into pulp. And the slices below the top ones were still yellow, but mushy as well. I got a dish of plain yogurt and scooped out another spoonful of my fermented banana slices over it, which made for a lovely snack. And I felt good eating it because I knew it was healthy. I MacGyver-ed my first banana ferment and it turned out fabulous. The day I tasted my first banana ferment, I went out and bought more bananas because I was out. That’s how much I liked them. 1) I increased the amount of sugar and salt in proportion to the bananas and water. About 1 rounded tablespoon of brown sugar and 1/3 teaspoon of sea salt (Note: if your ferments turn out well and your starter is good, you can use less salt or none at all. When I was confident that I had a strong starter to start every new batch with, I left out the salt completely). I used enough dechlorinated water to leave some room (but apparently not enough) and as many banana slices as I could fit. 2) I used a bit of the liquid left from my first ferment as my starter (instead of a probiotic capsule). 3) And instead of a glass, I used a large, wide jar with a locking lid. These jars are pretty easy to find. But you can use any clear glass container with a good lid. The reason glass is used (and not plastic) is because ferments will grow increasingly acidic as they progress. And any acidic liquid can corrode plastic and leech dangerous toxic chemicals into itself. This is also why vinegar is sold in glass bottles at the supermarket. This time, I left it in my cupboard to ferment for only two days. 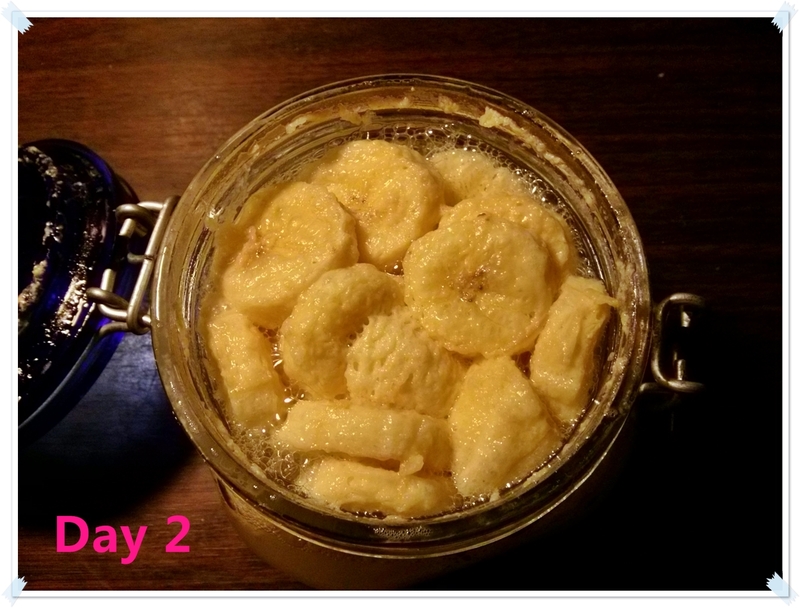 Over two days, my bananas fermented and bubbled (as ferments do). But there was SO much more “activity” compared to my other ferments. Everytime I popped the lid open to do my smell test, more bubbles would appear and burst through the surface. For the record, I did not do that. I think the bananas were fermented much more quickly on my second attempt because the leftover liquid from my first ferment (5 days long) proved to be a much better starter than a probiotic capsule. I would imagine that probiotic capsule powder would need to re-hydrate before the bacteria can propagate. But the leftover fermented liquid was already very active (and the nutrient-rich water was already an ideal environment for all that good bacteria). If you’ve tried fermented bananas, let me know how you like them! UPDATE: I’ve been continuing with my banana ferments and my favourite bit now is drinking the liquid. It’s tart, fizzy and slightly sweet and sour, and really refreshing when served cold. Also, the cooler weather has definitely passed and it’s been *really* hot and dry these days. Because of this, my bananas have been fermenting faster than ever. They’re done in about 12 hours or so — no kidding. When I get stubborn and leave them for a full day (>24 hours), they get fairly alcoholic and lose almost all the sweetness. Temperature matters a lot. If you live in a hot climate, you might want to shorten your fermentation too. Have you ever swam in the ocean and found that your sleep that night was so much deeper and more restful than usual? Well, there's a reason for that. Seawater has special qualities that soothes the nerves and helps to calm our minds and spirits. Keep your gut healthy - it's your body's second brain! The powerful antioxidant vitamin A and skin-softening potassium in bananas can moisturize dry skin gently. Just wondering how your bread tasted after baking as mine were sitting in the fridge for two days after thawing and smelled alcoholic, lol. I went ahead and used them but now it time to bake and I’m wondering if I made a huge mistake. I guess time will tell. Thanks for sharing your experience. Banana is my fav fruit flavor and going to try this. I googled about fermenting bananas on a whim and your site turned up. I don’t have a probiotic capsule but I do have tibicos (water kefir) brewing on the counter. I shall try a few grains of that and see what happens. I think water kefir grains should work just as well since the water/sugar environment is about the same, but I never had much luck with keeping kefir alive in my kitchen (eventhough I tried several times). It’s funny how some ferments work beautifully for some people but not for others. The single kefir “gem” is doing it’s job of creating probiotics. Lots of bubbles after 24 hrs. I tried a one inch chunk of banana, and it’s quite good. Question – sometimes I get free perfect eating bananas. Will refrigeration slow the brewing. That’s great 🙂 And yes, refrigeration will slow/stop fermentation. I always put mine in the fridge when I’ve made too much. It perks right up and starts bubbling as it warms up to room temperature again. Since I was a kid, loved bananas but they were always too heavy in my tummy – like a brick. I don’t get that from the fermented bananas. Thanks for opening the door. I shall try other fruits now. I’m newer at fermentation and until now had only done the usual veggies. I didn’t know about fermenting fruit. Good luck 🙂 Fermenting fruits can be very rewarding. I’ve personally found them to be more enjoyable to eat/drink than fermented veggies because there’s a bit of lingering sweetness there that balances the sourness really nicely. Love this! I just fermented pineapples, so delicious. As I was eating a banana after my pineapples I thought, Hmm, can I ferment bananas too? Did a search and found your page. I love this idea and I’m glad you shared your experience. Quick question, what were the condition/color of your bananas before fermenting? Where they ripe? Yes, they were ripe but I’ve also used bananas that were slightly unripe (a little bit of green on the edge) and those turned out fine as well. they ferment banana’s in Mexico by leaving a bunch of bananas in the sun and letting the sweet ness cook and slowly drip out of the (dried out blackish skins) into a bucket over a few days. This then is bottled with vegetables and chilli’s and left for longer. I think its got it’s own sort of active enzymes. I have put bananas in a colander with a weight on top to get that thick syrup and then bottled it using an airlock and got the strongest spirit/alcohol out of it without any starter whatsoever. I prefer food to alcohol which is why I clicked on this site. You know what though I’m sure there is new things to discover in this world of fermenting, with a whole world now sharing food, and plants and concepts. hmmm what next…? exciting. Oh that’s interesting, I guess it’s more common that I thought. I know that fermented bananas are also a dessert in Vietnam though I’ve no idea how it’s made there. I might try fermenting with no starter like you did sometime. I’ve not tried fermenting without a starter (too chicken), but it’s definitely an interesting idea. It should work as long as the good bacteria that’s already on the bananas win out over the bad ones. I guess that’s also probably how food was fermented in the old days — they just add a bit of salt and leave it somewhere covered. Do you mean you are using just the syrup or just the bananas or both? Hi Hanneh, sorry I missed your question. For the starter, I just used the liquid. lulu> Hey there. Saw your comment. It’s been 2 1/2 yrs. ago, unsure if you’ll ever find this (me) again. I was fascinated by your Mexico & alcohol info. Can you tell more about that? Thanks, appreciate your input. Tricia in Texas, independent & survival & healing nut case. I’m really excited about this post. We froze a ton of bananas since we didn’t want them to go bad, so I’m going to thaw some and try this. But instead of a probiotic cap I’m going to try using some of my kimchi liquid. It should add some spice to the sugar in the recipe. I can’t wait! I’m setting it up today! Hmmmm…Have you tried using whey as a starter for your bananas? I haven’t tried whey, but I think that should work just as well as a starter. What kind of probiotics did you use? I use Jarrow’s Jarro-Dophilus EPS. From what I’ve read, as long as the probiotic you use has lactic acid-fermenting bacteria (i.e a good amount of lactobacillus), it should be able to kick-start the lacto fermentation. Mine smelled like vinegar after 4 days. Any idea why? The instructions said a maximum of 2 days, and only 12 hours in warm weather. It’s pretty safe to say your ferment turned to alcohol, and then to vinegar in that 4 day period. That’s what most any sweet ferment will do. Banana vinegar sounds delicious! The floating to the top is normal, I had that too. From my experience, when it really starts to ferment and bubble up, the slices will rise up/out of the water surface — they’re incredibly buoyant because of all the little air bubbles. Some people use something heavy (like a clear glass lid) to hold down the floating slices below the water surface (the theory is that bad bacteria will multiply easily when the slices are exposed to air). I’ve actually tried doing this before using large glass marbles, but the bananas still broke through them and the marbles all sank to the bottom. So since then, I’ve forgone this step and haven’t had any issues with the slices floating to the top and breaking the water surface. It was also a hassle to sterilise the extra apparatus. And to answer your question, yes — if you wait long enough, the fermenting banana slices will all eventually sink, but that means they’ve stopped actively fermenting. I usually drink/eat my ferments before this happens because I prefer a sweet/sour taste than completely sour. And as silly as it sounds, they look “dead” when they all sink to the bottom… and that makes me sad. Hope that helps, and let me know how it goes (i.e fermenting without a starter). This is brilliant Sam! I’m nuts about fermenting for food medicine and am going to have a go at this. I live in the tropics and have fermented mango, papaya, jackfruit, lychee, pineapple, plums, peaches and nectarines without a starter. And wow, now you’re making me want to try fermenting more fruits. I love lychee! I just learned how to work with sourdough starter a few weeks ago, and one of the essential parts seems to be using a lid that allows air flow. Is air flow bad for fermenting fruit? I actually have no idea if air flow is “bad” for fruit ferments, though I doubt it is since fruit fermentation still occurs in nature with exposure and air flow. E.g. when a fruit falls from a tree, in the right conditions, it will still ferment on the ground and animals will eat it (this could be for the alcohol, but they might also instinctively know from smell that it’s good for them?). Anyway from my experience, whether or not it’s bad, air flow isn’t essential to ferment fruit either. To get air flow, I suppose you’d need to use cloth (since it’s air permeable) and a rubber band as a lid. The only downside I can think of is that the ferment probably won’t be fizzy. It’ll still bubble as ferments do, but without pressure, there won’t be much fizziness in the liquid. As far as the science goes, when I googled it, one variant of lactobacillus (used for lacto-fermentation) doesn’t appear to consume much oxygen at all. It does! Thank you so much for the reply. Gonna try it as soon as I can get some starter! I have also fermented dried prunes in a similar way. I used a “Now” brand probiotic pill plus 3/4 of a bag of prunes and RO water. Prunes soften in approx. 3-4 days. They are soft and delicious. Very cool 🙂 Dried prunes is definitely on my to-do list now. Thanks for sharing, Marina! Hmm… that’ll certainly be interesting to try. would u know if fermenting bananas, reduces the carb content? I also read that bananas could be used as a natural betablocker and was wondering if those substances could be increased after fermentation? In other words how do you feel after eating fermented bananas? Hi salami, I don’t know if it reduces the carbs, but it reduces the sugar. Not sure about betablockers either, but fermentation seems to increase the nutritional content of food and makes it more easily digestible/absorbable, so that’s hopeful. And I feel good after eating fermented bananas. There’s no overly full feeling that I would get from eating regular ripe bananas. best damned thing I’ve had in a long time (and the easiest to ferment)… THANK YOU! What probiotic did you use? I have had dreadful luck with pretty much everything I’ve tried fermenting. This sounds so easy and I want to try it out 🙂 What a great idea! Hi Tash, I use Jarrow’s Jarro-Dophilus probiotics. But any probiotic with lactobacillus should do just as well. isn’t there a need to let fermentation gas out during the process? Hi Yaniv, the glass jar looks airtight, but actually isn’t. If I tilt it enough, some liquid will actually drip out. I was surprised too, but I guess it suited my purpose. 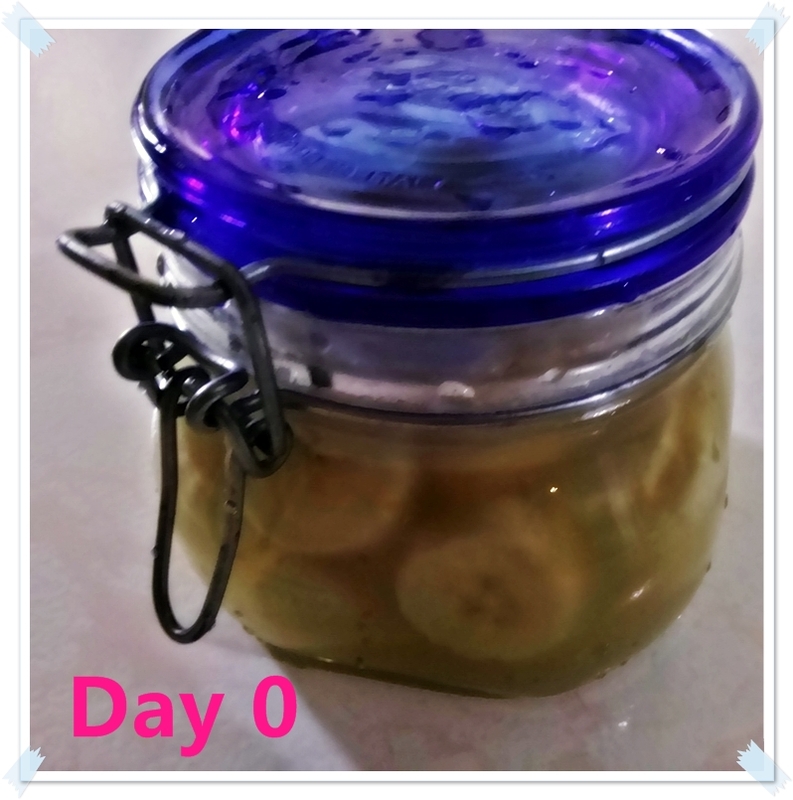 Hi, Samantha, i tried to ferment bananas but after 2 days it kicked out the lid. I put it back & put a brick on top of lid. After 2 days it tasted bad. Wat went wrong? Hi Thola, did you add salt and a good starter? Did you sterilise the jar first? If not, you can try again and see if you get a better result. Fermentation works when the good bacteria overpower the bad so the food will ferment instead of rot. It sounds like the bad bacteria won out in your case. But then again, there may be other reasons. You can also try not using a lid, but some cloth held over the mouth of the jar with a rubber band. Another thing you can try is putting it in a different room to ferment. p.s: And one last thing — it may sound rather silly, but I’ve noticed that the “feeling” really matters. I have had amazing results when I send some love and appreciation to whatever it is I’m fermenting. When I rush the process or worry and fret over it, it just doesn’t respond the same way. Thanx,for ur reply SAM, i followed all steps to the latter & ate my 1st banana fermentation. I enjoyed it. Awesome 🙂 And congrats on your first successful fermentation! Hi Sam, everyone, I’m experiencing skin breakage /rush around the skin under my armpits, should I continue with castor oil or take antibiotics? How to get a slim waist? I had several bananas that went brown as we didn’t eat them fast enough so I put them in a glass jar in the fridge (after peeling them). I’;m wondering if they have fermented though I didn’t add anything to them. Can they be used for anything even at this stage? Hi Dianne, just look out for signs of fermentation (smell, bubbling etc.) and judge for yourself. Psychic powers are not one of my abilities (unfortunately!). Even if they have fermented. They will still work fine in your banana bread or even yogurt shake. Or to make into fermented banana and jam. A local weight watcher, peels her banana, stick a ice cream stick thru it. Wrap it in aluminium foil and freeze the banana as a Ice Cream Popsicle. For hot days and exercising. I ferment Pineapples at my office table. Using only used, clean coffee powder Jars and sugar. Add in one or two slices of Lemon soaked with Honey, and it cleans up the the fermenting smells making them smells wonderfully alcoholic. Very drinkable in 3 weeks, but I usually cheats and eat the fruits anyway after the third day. I have to open the cap every so often and swirl the whole thing around. Quite Calming actually. In Asia, we call it Fruit Enzymes. And the peels of citrus fruits are made into Garbage Enzymes. For cleaning purposes. These look great! But aren’t these cultured bananas, not actually fermented bananas? I came across this while googling “fermented bananas” because I’m currently experimenting with fermenting bananas using sourdough starter and mashed bananas. I’m hoping to make a less sweet, fermented banana bread. There are differences between using live active cultures (such as a probiotic pill) and using wild yeast, aren’t there? Hi Kay, I’m not sure what’s the difference? Cultured foods are fermented foods, or at least that’s what I think. My fermented bananas are made through lactofermentation and good bacteria. I didn’t use yeasts, wild or not. I think fermenting with bacteria + wild yeasts will definitely create something different, could be something similar to kombucha or caium maybe. Can someone fament unripe bananas? and how can I do it? pls tell me which brown sugar and sea salt is that?is that brown sugar the one we use for tea?what about the sea salt the one we use for food? I tried this (one banana recipe) a few weeks ago using some sauerkraut brine and it was great! It took about 2 days, but I kept a few slices to ferment for more days and it did taste alcoholic and then vinegar-y, but then mold took over the top of the liquid overnight, so we did not eat it. Looked up fermented bananas and your site popped up…..I’m trying your suggestion for the bananas but noted you are fermenting other veggies/fruits etc. Could you please share the other recipes you have?? Hi Greg, I’ve given up fermenting veggies. I followed a few recipes online, but they just never tasted right to me no matter how many times I tried. I read that it can be like that — when it comes to fermenting, success will vary for unfathomable reasons (my kitchen gets strong gusts of wind.. maybe that’s it?). All I know is that I’ve had difficulty fermenting veggies and water kefir, but banana ferments and yogurts come out beautifully and easily. I’d love to be able to make my own delicious kimchi or sauerkraut though. Wow all the comments on this are encouraging. I am trying my alpha batch and found this on the internet when looking for tips. Because of your story, now I am going to try to use my fermenting liquid for more batches. Thank you. What an awesome idea, thank you so much!!! I make Rejuvelac fermented drink out of white or red cabbage and use to ferment veggies and nut cheese, in salad dressings, and to drink. After reading your instructions I started a banana batch with my Rejuvelac instead of a probiotic capsule. This is going to be interesting! Here is the Rejuvelac recipe just in case you or anybody else would be interested. It can be made with wheat berries or quinoa grains but I don’t do grains due to gluten intolerance so using cabbage is perfect for me. 3 c of cabbage (cut thin or in a food processor), 1 c spring water (non chlorinated), 1/4 tsp sea salt. Pour into a large mason jar, cover with a coffee paper filter fastened with a rubber band. Let sit 3 days in room temp. Pour into a nut milk bag, press out all liquid, discard pulp. Now make a new batch and add 1/4 c of the Rejuvelac (the 1st batch), now let sit only 24 hours, repeat the process. The 3rd batch is the best, and all following batches. Use within 24 hrs, it has the highest potency. Hi Yvonne, good luck with your experiment and let us know how it goes! often I have been gifted with cases of bananas and share them out with friends, family and neighbors. I am totally new to fermenting. My little sister has canned for years, so I conned her into helping me with my first attempt. It was also totally new to her. We spent about an hour chatting and ‘goggling’. Then the journey began. Our first batch is a total of 3 days old when I got another case of bananas. I just moved here one month ago. So. I like Yvonne’s starter. As soon as I can get that fixed up, I shall be trying the bananas. Thanks so much for sharing and keeping this thread so I could see the responds. Hi. I have fermented banana in honey. It’s going on day 5 and so far it smells good in the jar sitting outside. Should I refrigerate it. 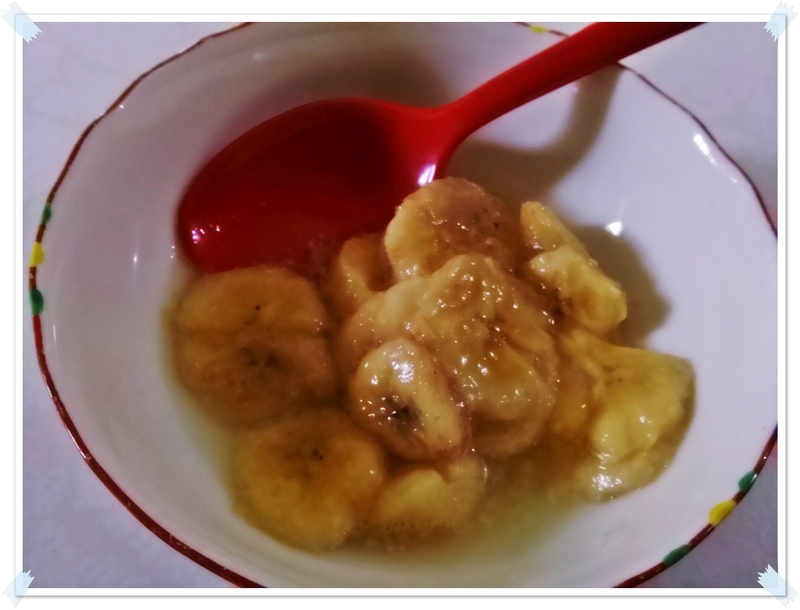 Have you tried banana in honey ferment before. I’ve been reading but have not found it mentioned here. Any advice would be appreciated. Thank you. if we could used this fermented banana as foliar spray to the growing crops, is there possible effect on it? What type of probiotic capsule do you use?? Hi Kimmy, as long as the capsule has lactobacillus, it will work. Lactobacillus is pretty standard in probiotic supplements, but you can still check the label to be safe. Using a bit of yogurt or whey should work also, for the same reason.